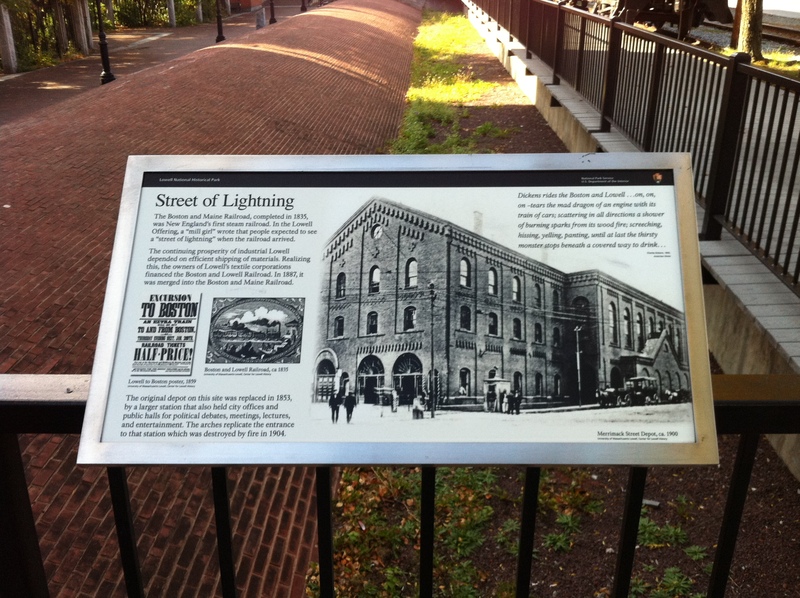 A sign posted at the site of Huntington Hall provides a history of the building. 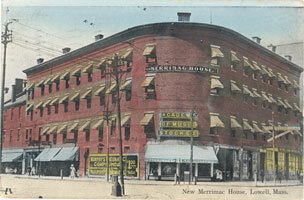 By 1904, the building that housed both Huntington Hall and the Merrimack Street Depot had served as the city’s main public gathering place for generations. 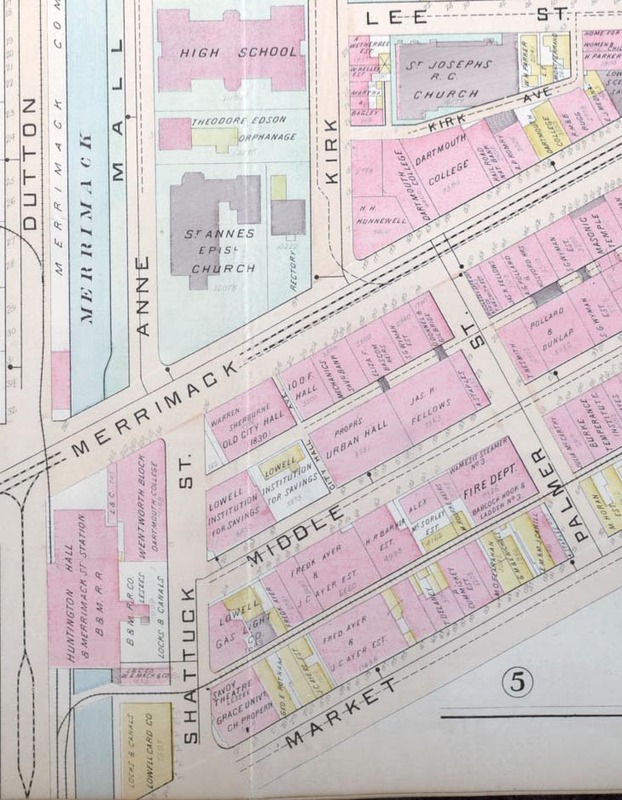 The City of Lowell and the Boston & Lowell Railroad entered into a joint agreement to build the hall in 1853, providing the railroad with the Merrimack Street Depot and the city with a public hall. Named for the early longtime Lowell mayor, Elisha Huntington, the building housed the hall in its upper stories, and the train depot on its bottom story. The hall was very prominent during the city’s Civil War years. In 1861, the Union’s Sixth Massachusetts Regiment left from the hall on its way to Washington, D.C., before meeting a tragic fate in Baltimore that left four of its soldiers dead, including Luther Ladd and Addison Whitney, now buried at Monument Square under the obelisk that bears their names. During the 1880’s, the hall housed memorial services for President Garfield and Generals Grant and McClellan. And a few years later, General Benjamin Butler made his final speech in the Hall shortly before he was laid in state there in 1893. The hall wasn’t without its problems. As early as 1856, three years after it was built, a crowd gathering to hear US Senator Rufus Choate speak grew so large that city councilman J. Frank Page later remarked that the hall’s floor, at its center, sunk by “about an inch, but it seemed to us as if it were ten feet”. Although his father, Jonathan Page later added two iron trusses to add support, the floor still sagged regularly under the weight of large crowds. In 1892, the safety of the hall was questioned again when a bazaar to benefit St. John’s Hospital drew such a crowd that the floor sagged under its weight. Just a few years later, in 1897, a fire damaged the hall so badly that the rebuilding effort took almost two years before the hall reopened on May 2, 1900. Policeman Noye was patrolling downtown Lowell early on the morning of November 6, 1904. He reached the corner of Palmer and Middle Streets. He looked in the direction of Huntington Hall and noticed a strange glow emanating from the hall’s Market Street windows. He was slowly approaching the hall when an explosion rocked the ground underneath him. He watched as a tower of flame blasted through the hall’s roof. He turned back, ran to the Central Fire Station, and pulled the fire alarm box. The fire department responded quickly. Members of Engine Company Number 6 arrived on Dutton Street within minutes of the explosion and prepared to fight the fire. They had not had time to erect their ladders against the Dutton Street wall when a second explosion rocked the building. Had they arrived minutes earlier, the falling bricks and debris would surely have caused severe injuries and maybe death. The explosion moved the Dutton Street wall of Huntington Hall by one foot. The Market Street wall, one foot thick and said to be “one of the surest in the city” – blew apart in the blast. Falling bricks split a freight car into two and destroyed a hydrant on Dutton Street. 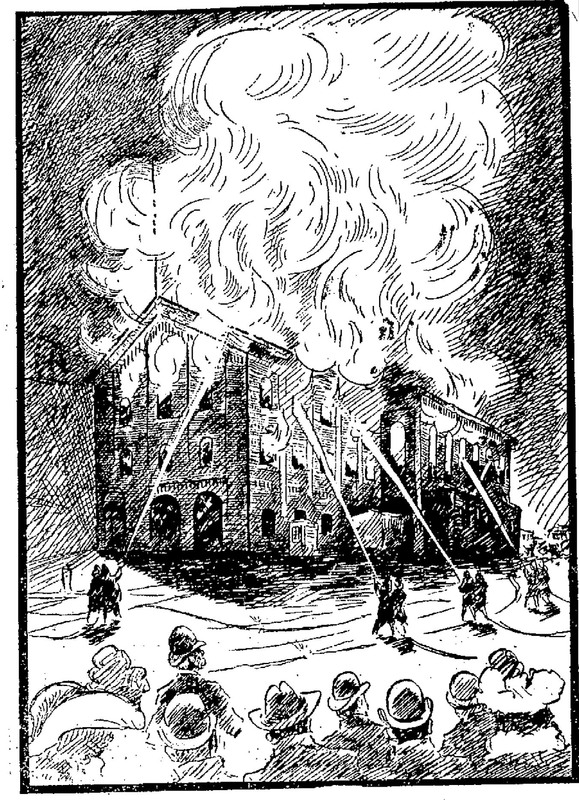 As the firemen prepared again to fight the fire without the hydrant, they soon discovered that the water was also drawn off in the canal – furthering complicating their efforts. Assistant Chief Norton took in the situation and ordered a general alarm, bringing in fire apparatus from all areas of the city. It wasn’t long before the firemen realized that the Hall was a total loss. The water was having no effect on the flames. The firemen next turned their efforts to saving surrounding buildings. And they succeeded. Flames caused little damage to surrounding buildings – though the explosion and water did. The one exception, the W.A Mack building on Shattuck Street was severely damaged when the second blast sent a pile of bricks onto and through the Mack building’s roof. At the Merrimac House, a hotel which once stood on the corner of Dutton and Merrimack Streets opposite Huntington Hall and at the current site of the Hess Gas Station, guests inside awoke to the sound of ringing fire bells and shouts of ‘fire’ outside. Those on the eastern side of the hotel, facing the hall, looked through their windows to see tendrils of flames shooting halfway across Dutton Street, threatening their hotel. The bricks on the Dutton Street side of the hotel grew hot; window glass began to crack. Guests panicked and began to cart out their hastily packed trunks. One hotel tenant, an Ike Harris, was seen lowering his loaded trunk from a fourth-story window toward Merrimack Street below. He, along with the other guests, were relieved to see the fire department’s water tower arrive moments later. Those knowledgeable of fire department equipment knew the hotel was safe. The others soon learned the same from the bell hops and night clerks. The fire heaved its last breaths from the Hall’s Shattuck Street tower, which lay beyond the streams of water thrown up by the firemen’s efforts. Out came the department’s Babcock ladder. Volunteers would be needed to ascend to the tower and cut out an outlet for the flames. Bill Foss and Robert Carleton, firemen long known for past heroic efforts, quickly climbed the ladder with axes, as high as the ladder would take them, and then “monkey-like shinnied up to the roof” to make holes so that the hosemen could reach the flames. By 6 o’clock that morning, the hall was totally destroyed. All of its interior floors had collapsed onto the ground floor and were spilling out from the Merrimack Street Depot’s street-level entrances. At noon, the “all out” signal sounded. The fire was out. The fire, occurring so early in the morning, did not attract the usual crowd. But the aftermath did. Thousands were said to have descended upon Merrimack and Dutton streets to view the damage. 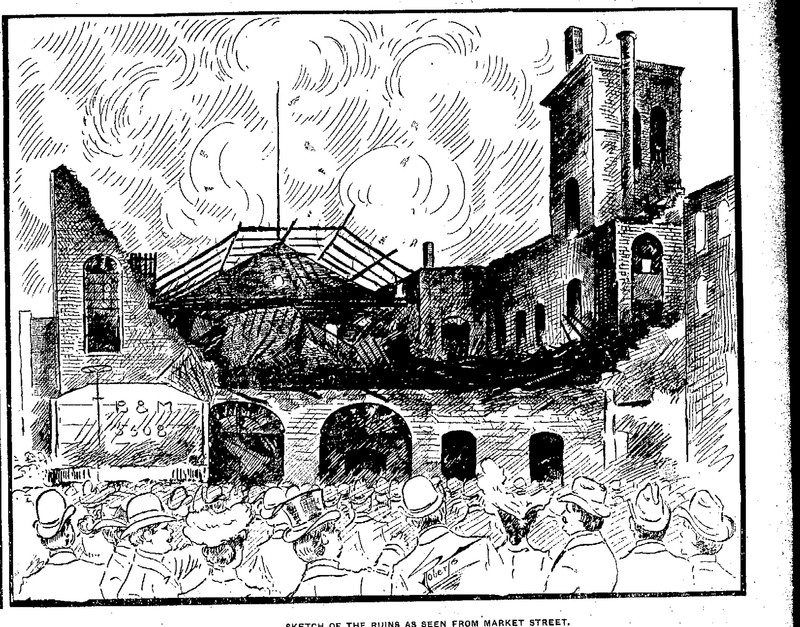 On the morning after the fire, the Lowell Sun estimated that some 40,000 people had come to view the ruins, many from out-of-town. The walls that remained standing were so dangerous that Mayor Howe later ordered ropes erected to keep the crowds away. The police guarded the ruins from would-be souvenir seekers. Photographers crept as closely as they could to snap photos. The cause of the fire was never determined, but some postulated that the source may have been a discarded cigar stub in a dressing room near the stage or by the scenery. Janitor Omer Smith, known as a loyal, hard-working city employee, had worked at the hall for years and believed the fire’s cause to be the electrical wiring. As he walked through the stage and the ante-rooms before leaving the night before, he had not seen any smoking cigars, or any signs of fire. After this second fire in seven years, the hall was never rebuilt. 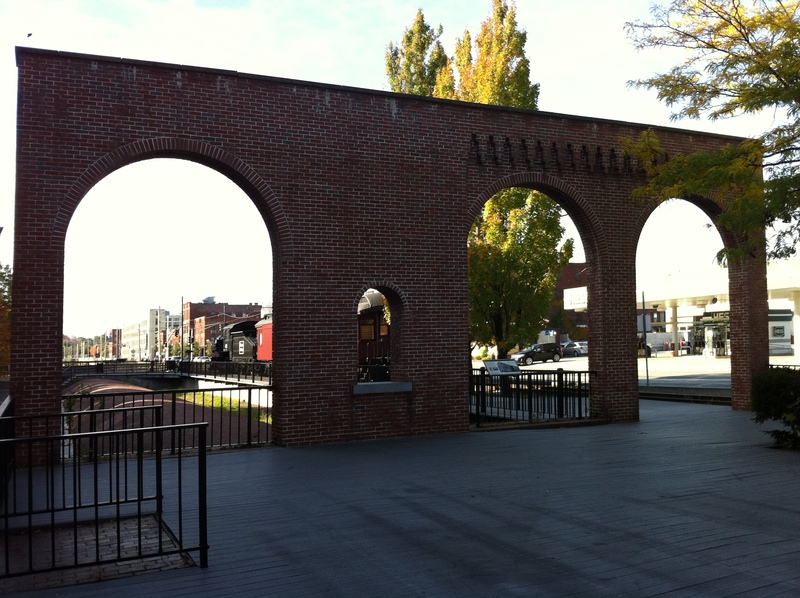 Its telltale arches were reconstructed and still stand today on Lowell’s Dutton Street. The Huntington Hall fire was the third large fire to hit Lowell, Massachusetts in 1904, and was the last major fire during a year that had opened to see fires that claimed the O’Donnell & Gilbride Department Store and St. Patrick’s Church. Today, all that remains of Huntington Hall are the rebuilt arches of its lowest floor. This series you’re doing on the Grand fires of Lowell is wonderful! In a world before electricity, fires were probably far more common than they are today. Thanks Karen – I’ve enjoyed learning more about the city, and having the chance to share what I’ve been learning. Have a Merry Christmas and Happy New Year! I find this fascinating, I am a Lowell resident who see’s this monument of the 1904 fire everyday as my window over looks this, I am in The Wentworth Building. I am looking for photo’s of before and after the Fire. I have a photo of an 1842 photo of The Wentworth Building hanging in my apartment. Would like to complete the building ‘s together. If you know where I can get this please let me know. Thanks. Great Article. The Wentworth is such a great building. Is its historical charm intact inside too? I’ve often wondered as I’ve looked up from Merrimack Street. The Wentworth is actually on my list of buildings that I’m researching for future posts. I’m not sure if I’ve seen a photograph or drawing of the Wentworth and Huntington Hall together, but I’ll watch for this, as I research the post. Hello, my employer purchased a stained glass window that was supposedly from the St. Patrick Church before the fire and was told it was the only window to have survived. He purchased it from a woman from the New England area that moved to Texas. I have now been tasked with the duty of finding out all I can on the church, before and after pics, etc. Would love to speak with you more in detail of possible! The bottom of the window has the inscription in the stain glass with the names of John and Hanora Sullivan. Anything you could share would be greatly appreciated!